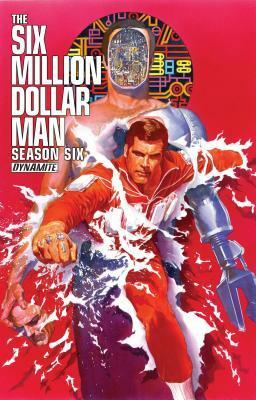 I recently reviewed a Star Trek graphic novel that I found to be really tremendous (see review here) and so I hoped to continue my trip through nostalgia with this Six Million Dollar Man graphic novel. Perhaps my memory is fading, but I don’t remember the series being quite like this. For those who don’t know, The Six Million Dollar Man is about test pilot/astronaut Colonel Steve Austin who experienced a tragic accident. Using ‘new’ cybernetic technology, military grade doctors replaced his legs, one arm, and one eye with bionic parts (hence the price tag), changing Colonel Austin into a cyborg. Using his now incredible speed, strength, and vision, Austin does specialty work for the government, saving the US from all nature of bad guys. This book starts off familiarly enough with Steve Austin acting as a one-man army to help someone escape illegal imprisonment in a South American country. But from there, the story spirals downward into a B-grade sci-fi flick, complete with an uncontrollable robot army and humans turned into winged monsters. Um … yeah. Robots and monsters. My willing suspension of disbelief only extends so far. And I could accept even this if the story itself were a little tighter and better executed. And of course this is a graphic novel, so the art plays a major part. And if the interior art looked anything like the cover as you see above, this would be fantastic. Unfortunately, this isn’t so. Not too long ago I reviewed a few graphic novels that were almost insulting in their depiction of the female lead characters. Their bodies were more shapely and pronounced than the famous Barbie™. This book is the male counterpart. The men in this book, even the nerdy scientists, have bodies that would make the stars of the Spartacus tv series jealous. Most of the characters in the book did not really resemble the actors who portrayed the characters in the television series. At times this was frustrating because it appeared as though there was an effort to make the resemblance, but it didn’t work. It was complicated by the fact that the cover art DID resemble the tv stars. Even so, this ‘failing’ can be over-looked as long as the appearance is consistent. Mostly it was — just with added ten-pack abs and Schwarzenegger-like arms and legs (why do artificial limbs need to look overly pronounced?). All in all, I could have accepted the less-than-stellar art if the story hadn’t deviated into the morass that it did. Looking for a good book? The Six Million Dollar Man: Season 6 tries to carry on the thrill of the old television series but perhaps suggests why there wasn’t a season six.